Motion-based controllers and gamepads are the go-to solution for most virtual reality applications due to their usefulness in games. The problem is that not all virtual reality applications are games. Virtual desktops, for example, focus on productivity where input devices like keyboards are paramount. Logitech is addressing the problem of text entry in virtual reality with its new BRIDGE developer kit. Typing in the virtual world is possible but it’s not easy. Even if you’re skilled at touch-typing on a standard keyboard, it can be difficult to properly position your hands on the board once you’ve moved them away from the home row keys. This is where Logitech comes in. Its dev kit consists of a Logitech G gaming keyboard and accessory that positions a Vive Tracker on the keyboard. The idea is to bring a view of the keyboard – and your hands – into the virtual world so you can type without having to blindly try and find the keyboard. 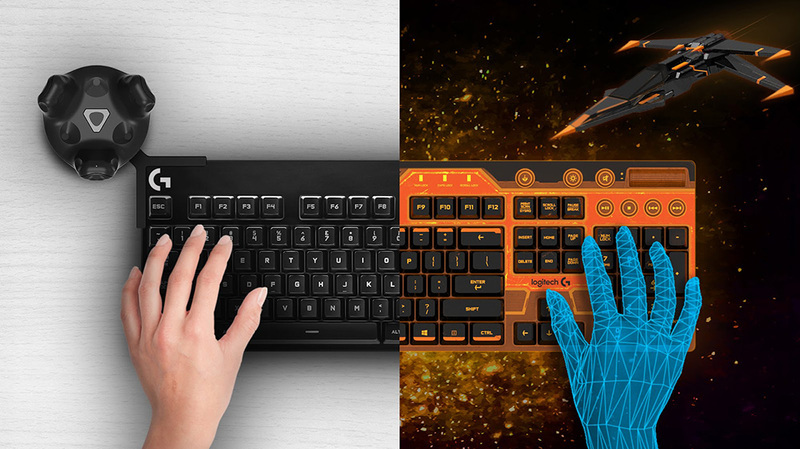 Bringing your keyboard into the virtual world is just one part of the equation. The lure of customization is also attractive. Imagine being able to change the font on your keyboard, colorize select keys or create custom labels for hotkeys. With BRIDGE, it’ll be possible across apps based on SteamVR. Logitech will initially be seeding kits to just 50 developers (you can apply for a kit through November 16). Vincent Tucker, Director Of Innovations & Strategy at Logitech, says they may build additional kits for purchase after the first round goes out if there is sufficient interest.